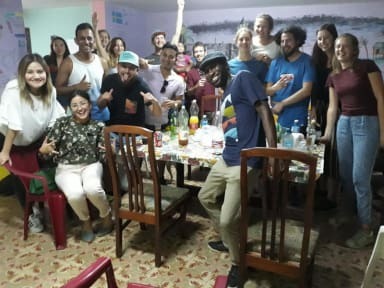 Hostal Mirella para Mochileros is the perfect place for making friends and meet people from all around the world. The Hostel is ideally located in the center of Havana. Guests can enjoy the living room, balconies overlooking the street and breakfast can be served daily upon request. The hostel has 2 shared rooms each with its own bathroom with hot and cold water, air conditioning and fans, you can also use the terrace of the house. The Hostel is located just 3 blocks from the University of Havana, 5 blocks from the Malecon Habanero, 7 blocks from the famous Coppelia and Habana Libre Hotel, 2 blocks from Parque Trillo where you can have WIFI access, 2 blocks from the Museum Napoleonic Havana. Perfect location for those who are looking for a great adventure in Havana. The hostel has 2 rooms for 6 or 8 people. 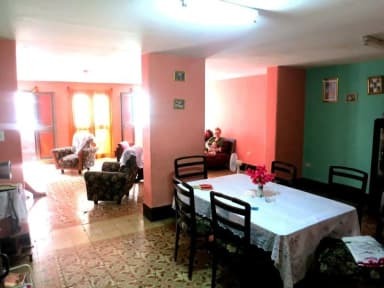 The rooms are well distributed giving a cozy atmosphere to the guests to make friends, have air conditioning and 2 fans, has a shared bathroom with cold and hot water. Check-in time 2 pm to 9 pm. Breakfast NOT included. 2 euros per person per day. One of the best hostels I've been to in terms of helpfulness and hospitality of the hostel owner, Mirella helped to make Cuba a much easier and more pleasant experience. For our last day in Havana we decided to stay at Mirella's hostel! It was the best decision! We met so many travellers like us, we organised our night out and then met again in the morning to say goodbye! The atmosphere is really nice as the hostel is located near the university area and Mirella has lots of maps with details on how long it takes to walk to certain restaurants, clubs etc. Prices are really affordable and the place feels homely and welcoming. Had a great stay at Mirellas. She's an amazing person who made me feel like home. Wish I had more time here. She also has plenty of good recommendation of what to do and good and cheap restaurants. Met lots of other solo travelers as well. I loved this hostel. It's about a 25-30 minutes from Old Havana. The location gave me a much fuller picture of Cuba. Mirella is fabulous and very helpful. There was plenty of refrigerator space and she was also fine with us using the kitchen area. The hang out space was big with a balcony and I got to meet and chat with so many wonderful people. I recommend this space and would come back. I loved staying at Mirellas! It is like a home away from home. Mirella is super friendly and helpful and her pets (3 cats and a dog) are the sweetest new friends you could hope to make. She has free water, and lockers for your valuables (small lockers, large enough for cash, passport, documents, etc). I made a lot of new friends at this place, some of which I traveled with to other parts of Cuba. I highly recommend it, and I will be back! I had such a lovely stay with Mirella! Her and her family are so friendly and helpful. I had a nightmare with my bag at the airport, and so as well as waiting up for my midnight arrival Mirella did all she could to help me find my bag. She is full of advice and I stayed with her again at the end of my trip. The hostel was also great for meeting other solo travellers and was in a location that was walkable to all key places in Havana. Would highly recommend! Mirella was such a wonderful host. She was so helpful and flexible with my booking which made it easier to change my itinerary if required. Thanks Mirella! Everyone staying here were solo travellers so great for meeting people. The owner is really nice, the rooms and bathroom are standard for Cuba and you each get a locker. It's in Central Havana, so about 25 minutes walk to the old town, which is actually really nice as the old town is really really touristy, it's good to get to know another area of the city too. I'll be staying there again!